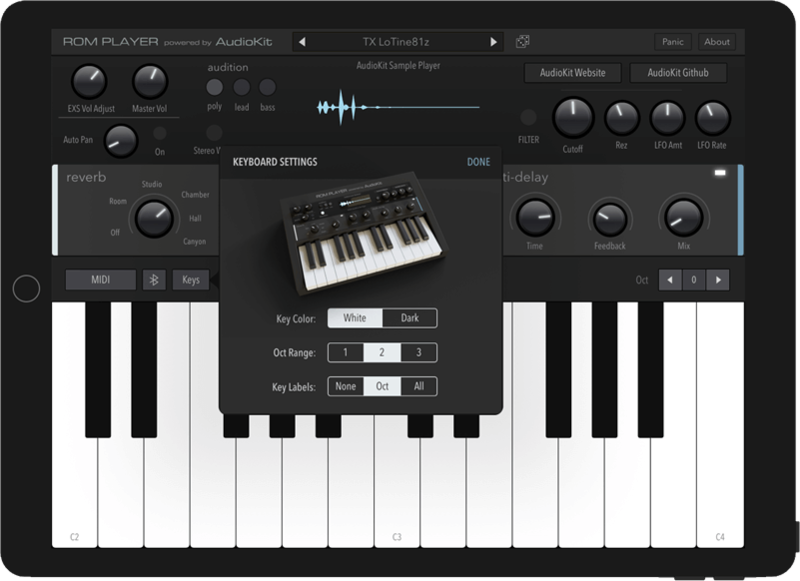 This free iPad instrument is inspired by classic 80s DX synthesizers. A true labor of love, we have spent months lovingly crafting this free source code for you, and sampling the sounds. It’s finally available today in the app store for FREE. If you can, please check it out and give it a good review. We’re all volunteers. This small favor to us will help us continue to make apps for you! 🙂 Thank you! Over 65+ presets included, completely free! Want to make your own instrument like this? Download the source code that powers FM Player below. AudioKit ROM Player is a completely free and full-featured professional sample playback instrument example. You can replace the included sounds with your own creations and upload to the app store! Record your Grandma’s Piano, a neighbor’s cat, or even your cousin’s Tuba. And, use this code to make an iOS instrument out of it. Impress your friends. Build a custom instrument for your own use. Or, even sell your custom instrument creations. You’re free to use this code however you’d like. It’s free and open-source! Meaning, you don’t have to pay us anything. Plus, AudioKit has all kinds of included pre-built filters, effects, and other audio signal processing classes to get you started and help you build the music app of your dreams. This code can be modified to play EXS24, Wave, or Sound Fonts. This is an open-source project intended to bring joy and music to people, and enlighten people on how to build custom instruments and iOS apps. All product names and images, trademarks and artists names are the property of their respective owners, which are in no way associated or affiliated with the creators of this app, including AudioKit, AudioKit Pro, LLC, and the other contributors. Product names and images are used solely for the purpose of identifying the specific products related to synthesizers, sampling, sound design, and music making. Use of these names and images does not imply any cooperation or endorsement. Yamaha, DX7, DX7II, and TX81z are trademarks property of Yamaha Corporation. We appreciate their amazing work in creating such classic and inspiring instruments.